To top it all off, hearing today that this winter is the WETTEST on record in Seattle makes me dream of summery climates. Like Arizona... like a desert with sage and cacti, and sunshine. So I felt this cocktail was appropriate to post today. Sunny, bright, delicious. Kick off your weekend and make sure to put on sunny disposition. We had this at Tango restaurant on Capitol Hill in Seattle a couple weeks ago; great food, great drinks, this place focuses on tapas and other Spanish specialties. This cocktail was unusual and delightful, served over ice with an orange twist, but strained and served straight up is great too! 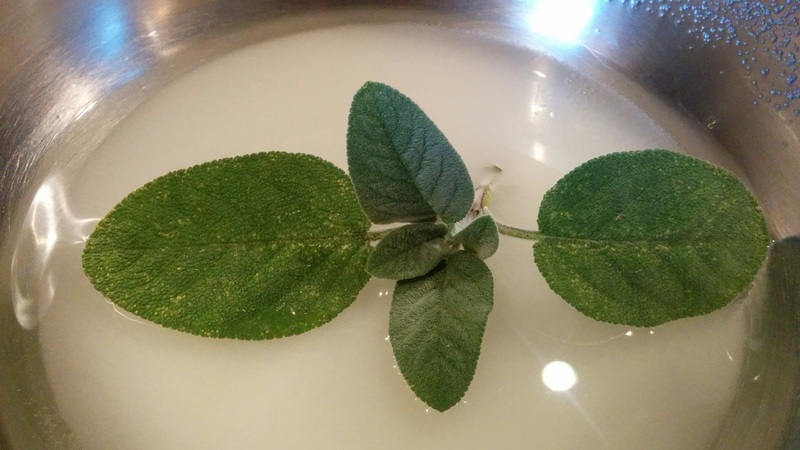 Sage simple syrup is easy to make, but you do need fresh sage to do it. I think it makes the cocktail... just gives it a great flavor nuance. The original cocktail listed lemon juice, but I had some really great, tangy oranges, so I used orange juice instead as I like ginger and orange together. You could do lemon, or even a bit of both. Make the sage simple syrup by adding the fresh sage into a saucepan with 1 cup of water and 1 cup of sugar. Bring to a boil and then turn done to low and let simmer for 5 minutes. Have a taste (careful, it's super hot!) and you should taste the earthy sage taste. Never fear, this flavor is awesome when mixed with the rest of the ingredients. Remove from heat and let it cool for a couple of minutes. 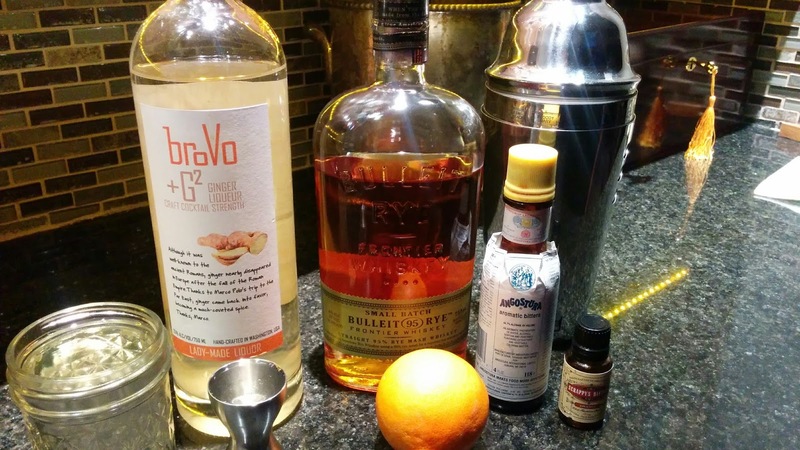 Mix the ingredients as listed above(except the orange peel twist) in a cocktail shaker filled with ice. Shake, shake, shake. 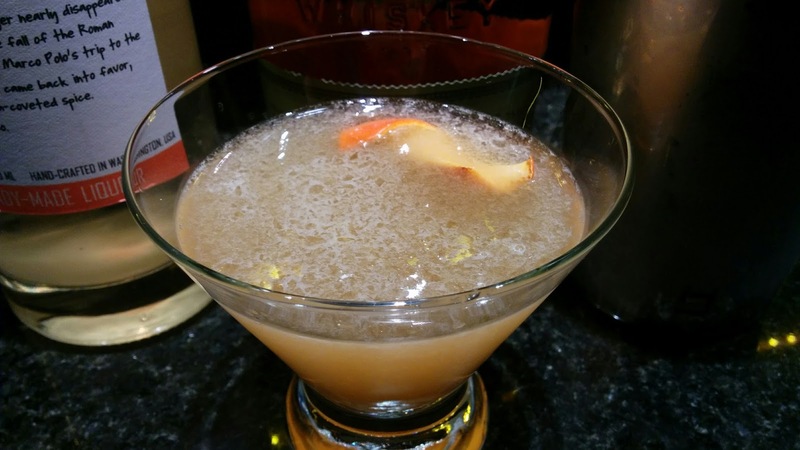 Strain into a martini glass, twist the orange peel over the drink to release the oils, and serve at once. I use "sushi" in quotations because this is a lot like eating a California roll, but really has not many authentic type techniques. I found this recipe on this cute site, but only changed a couple of things. The combination of flavors and textures make this a very satisfying lunch, light dinner, or if made in small dishes, a nice appetizer too. 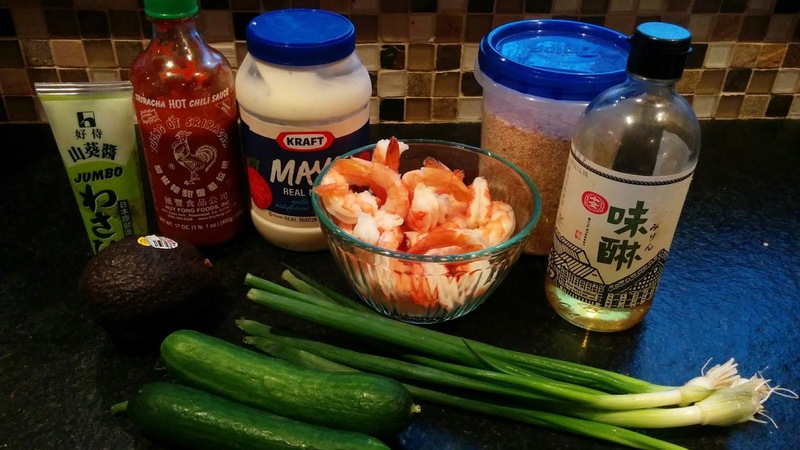 The crunch and freshness of cucumber is perfect with the rich texture of the avocado, prawns (or crab!) and then topped with brown rice flavored with a small amount of sweetness from the rice vinegar. 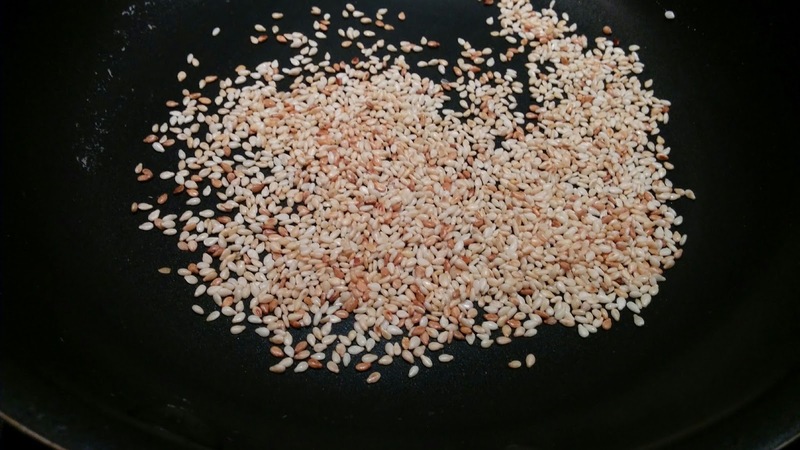 Top with spicy sauces and the crunch of sesame seeds. We amazed at happy and satisfied we were after a dinner of these. Cut up cucumbers, add minced green onions and a sprinkle of salt. Stir to combine and set aside. Add the rice wine vinegar to the rice and stir to combine. Set aside. 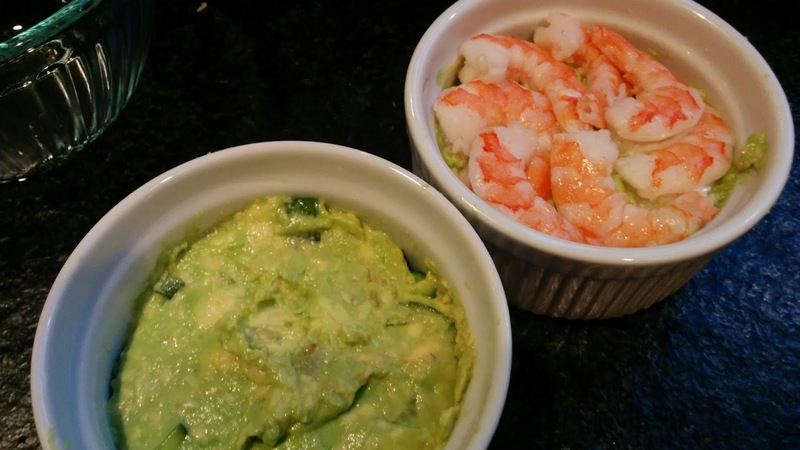 In the bottom of large, flat bottomed bowls (I used large 5" ramekins, but a cup measure might work), add a the first layer with cucumber, add the smashed avocado, then prawns, topped with rice. Pack the rice lightly in the cup. Invert on the serving plate and tap gently. If needed, use a knife to run around the inside edge to loosen the mixture. 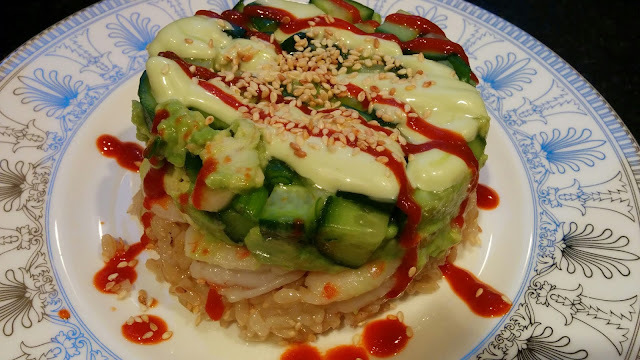 Top with dressing(s) and sesame seeds. 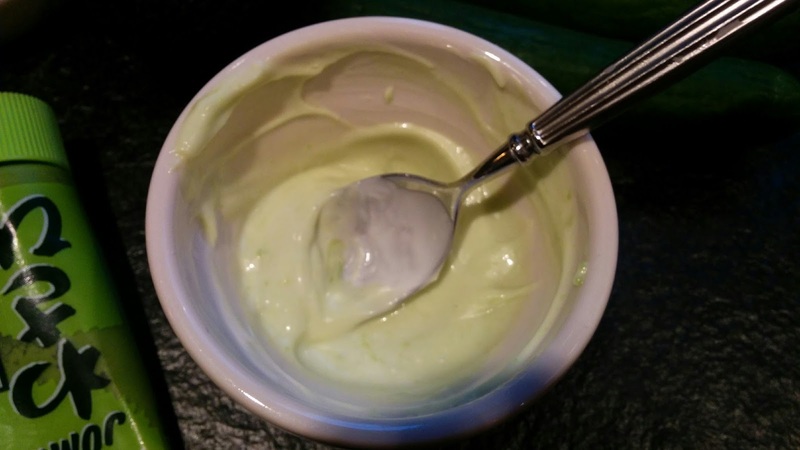 The wasabi mayo is pictured below, I added a small of amount of water to give it a better consistency for drizzling on top. You can use soy sauce too, but I was trying to keep the sodium levels down. I didn't take a picture of the cucumbers at the bottom of the dish, but the order is salad first, avocado second, prawns (cut yours into pieces, having whole pieces was harder to eat), ending with the sushi rice. If needed, Toast up your sesame seeds in a small fry pan for 1-2 minutes over medium heat. Watch them, they can burn quickly! Awww, isn't that sweet? Who knew I was such a romantic? 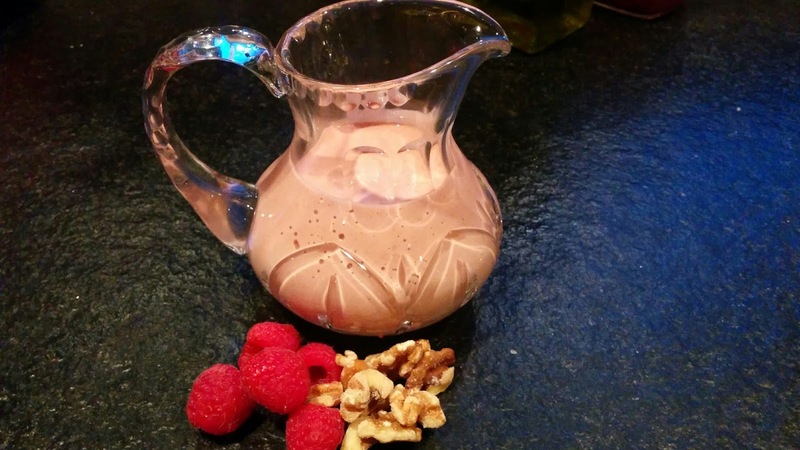 This is pretty pink dressing with tang and sweetness perfect for a salad anytime. No cream in this one, only the blended nuts give it the great creaminess. 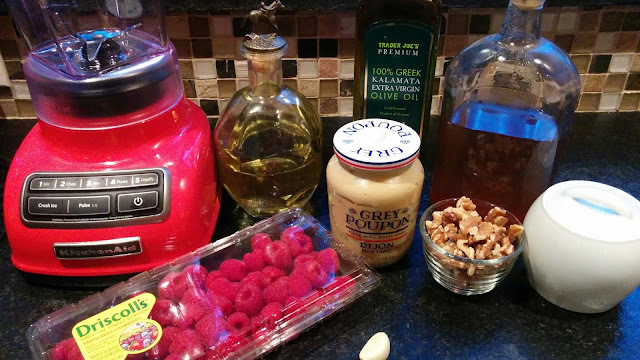 Need some other ideas for homemade salad dressing, check out this versatile recipe. 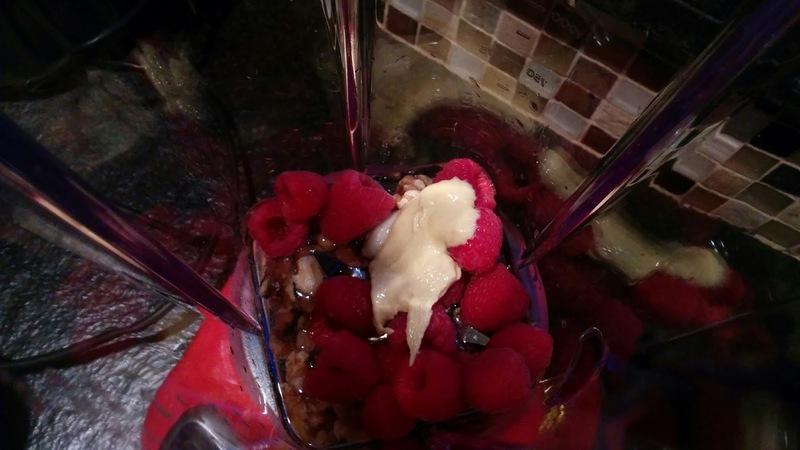 In a blender, add raspberries, walnuts, vinegar, garlic and mustard. Blend until smooth. As the blender is running on low, add a stream of oil through the hole in the lid (that's what it's there for!) and then add the water slowly. You may need to scrape down the sides a bit and blend again. Serve with fresh greens. Great topped with feta cheese, more fresh raspberries, candied walnuts and green onions. 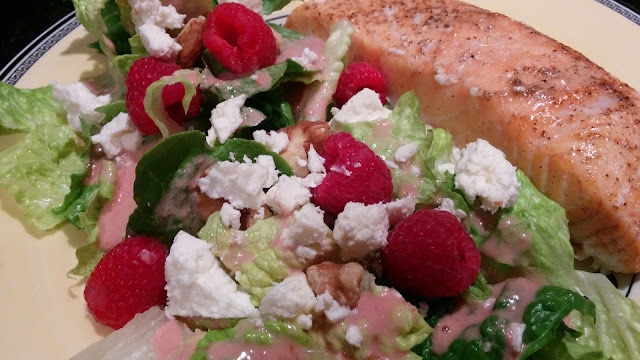 We served it with a piece of baked salmon and the raspberry vinaigrette was great with the fish too. Here's a dark little shot of the inside of the blender, just to give you and idea of how I just threw all the ingredients in and blended it up! 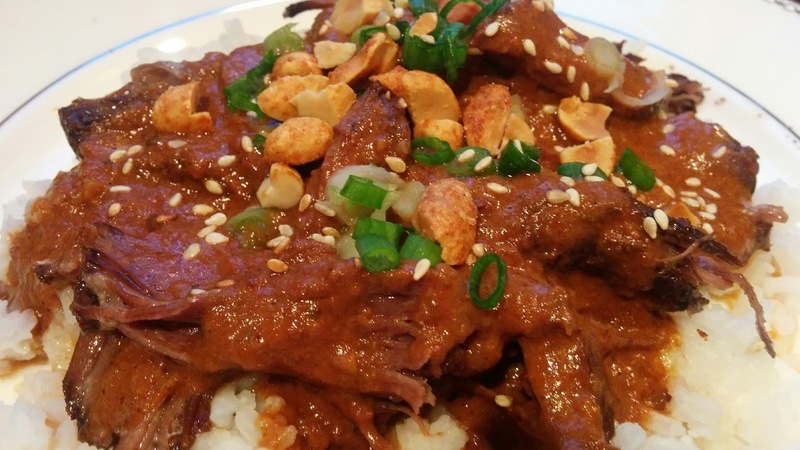 Yummy tender pot roast with a terrific but easy molé sauce. Molé sauces are known for their complex flavors, each one adding some nuance to the sauce. Chocolate, fruit, spices, nuts- every cook has her version. This one was an easy one that I came up with one day when I had a pot roast I wanted to make on a chilly day. This is perfect for tacos, burritos, over rice, over polenta, as filling in tamales.... how do you want to eat it? Cook on low for 6-8 hours. 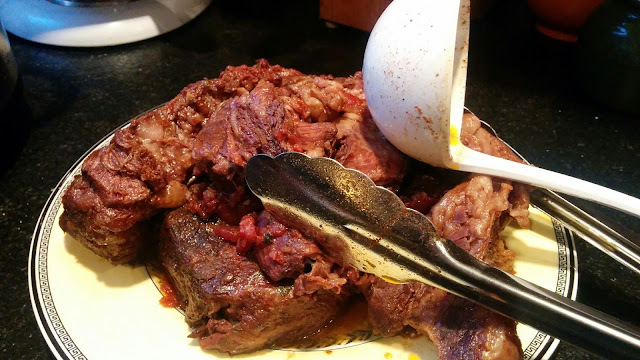 The meat should be very tender and will shred easily. Carefully remove the meat from the crockpot and put on a platter. Add the liquids to a blender and let it settle a bit. Skim off as much of the fat showing on top as possible. 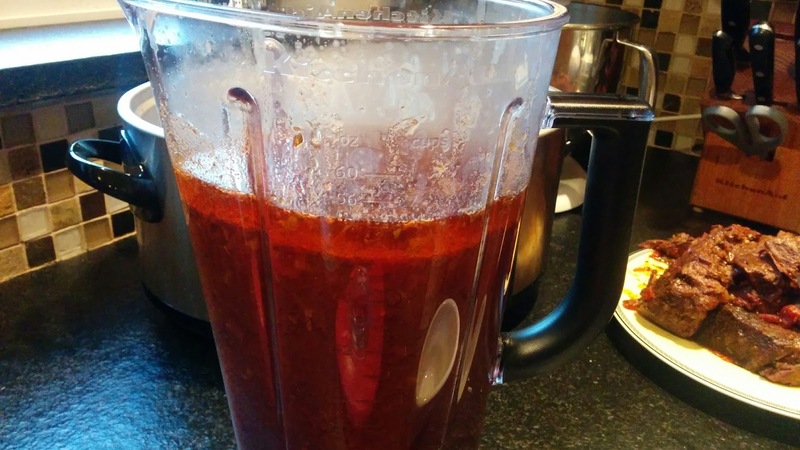 Blend the remaining liquid into a great sauce. You will have more sauce than you might need, but this would be great on top of enchiladas, or other grilled meat. Serve the meat with extra sauce on the side, or shred the meat and mix the sauce with it. With the meat, I removed whatever fatty bits I could see and then "chunked" or shredded the rest of the meat. You could also slice it, or serve it whole, serving at the table. 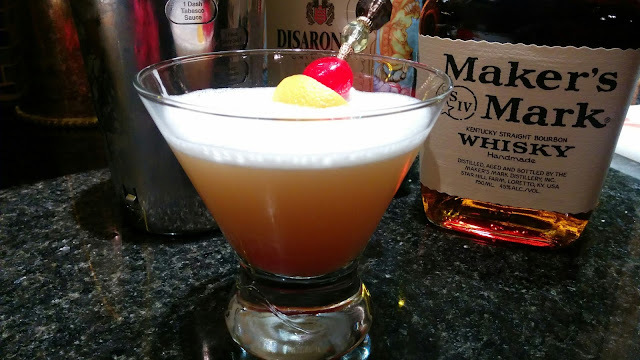 I had never had a Amaretto Sour before reading an article in Food & Wine in the Jan 2016 issue. 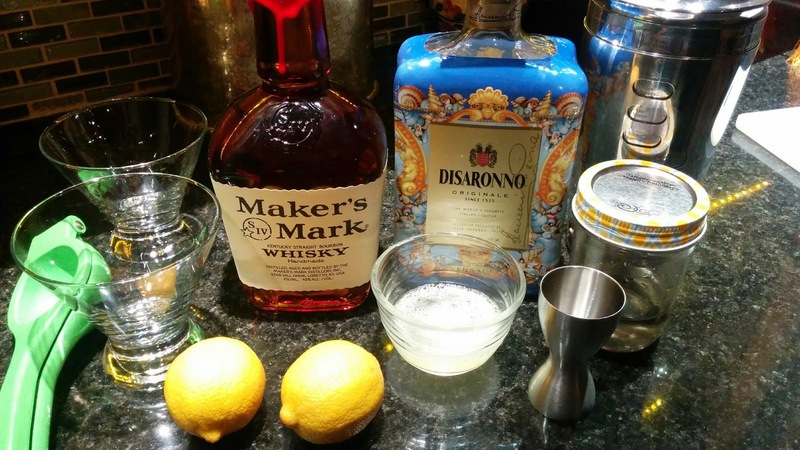 It talked about how "old school" 80's cocktails were making a comeback, for good reason- they tasted good! Well, aside from the "old school" part which kinda hurts my feelings, I felt the need to whip a couple of these up. Yum! Tangy, not too sweet, frothy and boozy. We liked them! Then a couple days later, we ordered these out at a bar while waiting for a movie to start. Yuck... so sweet we had to ask for WAY more lemon. Don't take this one on a bar version alone. Give this a try. One note- I like things SOUR, if you don't you might want to start with half the called for lemon juice and see what you think. Note two... don't start on me about raw egg whites! You eat cookie dough don't you? Also, if you have a comprised immune system, then what the heck are you doing drinking anyway? LOL, hate to rant, but after the week I've had I feel entitled. Over rocks, or strained into a martini glass, it's all good. Fill a shaker with ice, add all the booze, ending with the egg white. Shake, shake, shake. Strain into a martini glass, or over ice in double old fashioned glass.